NORFOLK, Virginia (NNS) — The Navy with assistance from the submarine’s sponsor Elisabeth Mabus, daughter of the 75th Secretary of the Navy Ray Mabus, commissioned and brought to life the newest Virginia class submarine, USS Washington (SSN 787), during a ceremony on board Naval Station Norfolk, Oct. 7. Washington, named in honor of the 42nd state, is the 14th Virginia-class, fast-attack submarine to join the Navy’s operational fleet. Elisabeth Mabus expressed how proud she was of the crew and their families. Mabus gave the order to “man our ship and bring her to life” before the crew of about 130 men ran across the brow, onto the vessel. Washington is the fourth of eight Block III Virginia-class submarines to be built. The Block III submarines are built with new Virginia Payload Tubes designed to lower costs and increase missile-firing payload possibilities. The first 10 Block I and Block II Virginia class submarines have 12 individual 21-inch diameter vertical launch tubes able to fire Tomahawk Land Attack Missiles (TLAMS). The Block III submarines are built with two-larger 87-inch diameter tubes able to house six TLAMS each. “We won’t know what challenges we will face as a nation in 10, 15 or 20 years, but we know because of the work being done now at Newport News and Electric Boat and by the Sailors who call this ship home, USS Washington will be prepared for whatever is to come,” said Mabus. USS Washington commanding officer, Cmdr. Gabriel Cavazos, highlighted the Washington’s capability to dominate the undersea domain and enable military success in any engagement. “As I have told the crew on many occasions, they are the most important component of the ship. They give the ship its personality and warfighting spirit. Without the crew, Washington would not be the warfighting platform she was built to be; however, combine the two, and, together, we are the Blackfish,” said Cavazos. Today USS Washington is alive and stands ready for mission. “Thank you for being here to celebrate this momentous occasion with us,” said Cavazos. 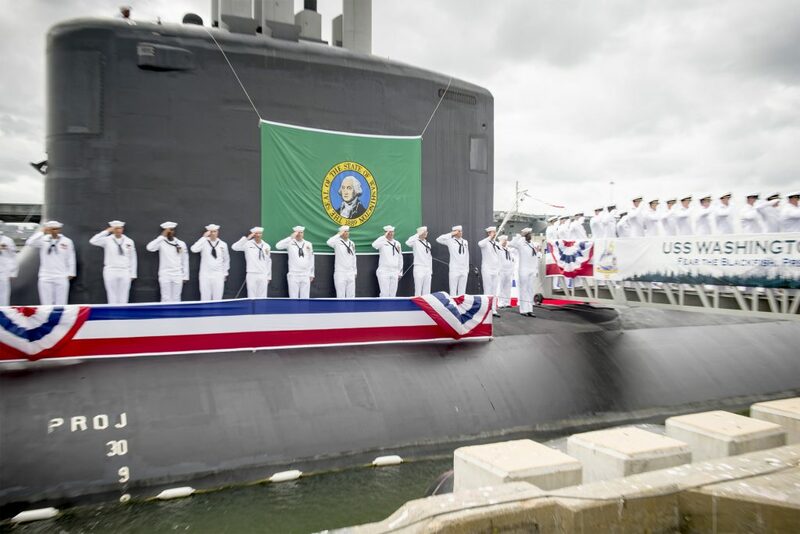 Washington is the fourth U.S. Navy ship, and first submarine, to be named honoring the State of Washington. The previous three ships were an armored cruiser, (ACR 11), which served from 1905 to 1916, the battleship (BB 47) a Colorado-class battleship launched in 1921 and sunk as a gunnery target in 1924 after her construction was halted, and the battleship (BB 56) credited with sinking more enemy tonnage than any other U.S. Navy battleship during World War II, serving from 1941 to 1947. Washington is a flexible, multi-mission platform designed to carry out the seven core competencies of the submarine force: anti-submarine warfare; anti-surface warfare; delivery of special operations forces; strike warfare; irregular warfare; intelligence, surveillance and reconnaissance; and mine warfare. Their inherent stealth, endurance, mobility, and firepower directly enable them to support five of the six maritime strategy core capabilities: sea control, power projection, forward presence, maritime security and deterrence. Construction on Washington began September 2011; the submarine’s keel was authenticated during a ceremony on Nov. 22, 2014; and the submarine was christened during a ceremony March 5, 2016. This entry was posted in Commissionings and tagged commissioning, commissionings, uss washington. Bookmark the permalink.